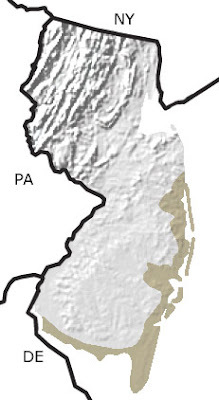 Ice sheets advanced and retreated across northern New Jersey three times during the Quaternary. 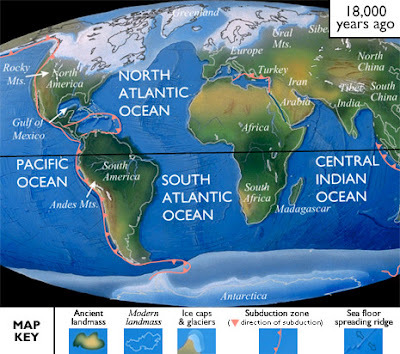 During each glacial advance, sea level fell nearly 100 meters as water was trapped in the large ice sheets. Mastodons, mammoths, and other large mammals roamed the newly exposed land, and their skeletons have been recovered from Pleistocene-age swamps and peat bogs that formed during the last glaciation. Fishermen have also dredged the bones of these mammals from the deep continental shelf off the coast of New Jersey. This map indicates that the primary exposures of Quaternary rocks are found along the eastern and southeastern coastal regions. North American Paleogeography: In North America, glaciers swept down across Canada several times during the Quaternary, extending south into the U.S. as far as present-day Kansas. As the glaciers moved south, they picked up sediment, gouging out features like the Great Lakes and Finger Lakes, and dropped it in different places, forming features like Long Island, Cape Cod, and many of the hills from Pennsylvania to South Dakota.